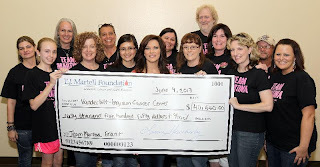 (Nashville, Tennessee...) - Superstar singer/songwriter Martina McBride and her nationwide volunteer group, Team Martina, recently awarded the "Martina McBride Breast Cancer Research Grant" in the amount of $40,550.00 to Nashville's Vanderbilt Ingram Cancer Center, it was announced this week. The grant was given through T.J. Martell Foundation, the music industry's largest charity that funds leukemia, cancer, and AIDS research. The funds will be used to assist triple negative breast cancer research at Vanderbilt. Team Martina member Taira Baughman lost her battle this year with this same type of breast cancer. She appeared in Martina's video for the song "I'm Gonna Love You Through It" in 2011. "I am so proud of this amazing team of volunteers," said Martina. "They are truly making the world a better place with their fundraising efforts and I'm honored they are doing it in my name. We give this grant in honor of our friend and team mate Taira Baughman who was an inspiration to so many. She dedicated her life to her family and to helping others and this grant will undoubtedly touch the lives of countless women." Team Martina, a nationwide and global community service group of country music fans dedicated to making the world a better place through volunteerism, held various fundraisers around the country starting in the fall of 2012 and culminating with a sound check party with Martina in Morgantown, WV. Since 2011, the group has raised more than $100,000 for various causes. Fans can catch Martina this Friday, July 26 in the WCOL Celeste Center at The Ohio State Fair in Columbus, Ohio. Tickets are available here.